Venus sits a bit over midway between the Hyades and the Pleiades (to get a good view of this image, especially on older monitors, you have to click on it for the larger version). The image does not do justice to the sight of this bright planet glowing between the glittering swarm of the Pleiades and the warm orange glow of Alderbaran. Over the next few days Venus will glide closer to the Hyades, coming closest to Alderbaran on July 2. 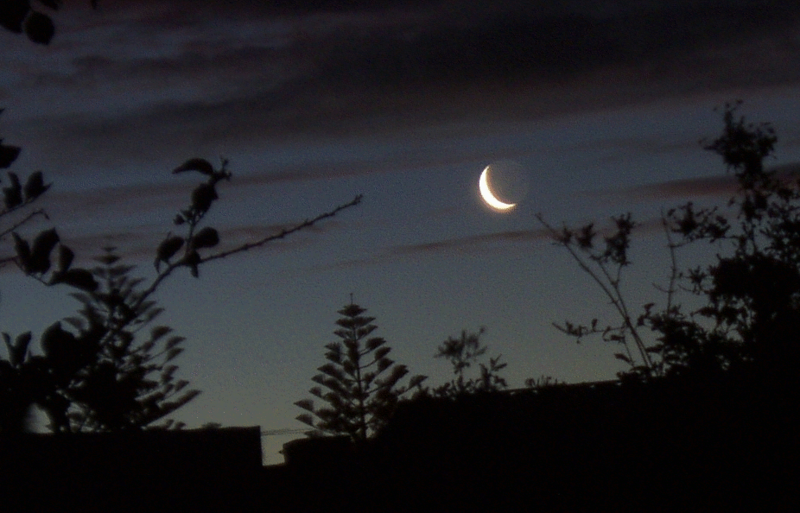 Sadly, it is going to be cloudy over the next few days here (missed out on the planetary line-up with the Moon too). If you get up around 6:00 am, local time, you can see Venus shining between the lovely Pleiades and the Hyades. I'm going to try an get a photo of this, but my favorite viewing spot has a blasted great tree in the way. I need to to a bit of gymnastics to see all three at the same time, so a bit of a hike may be in order. Over the next few days Venus will come loser to the Hydaes, and by around July 2 it will look as if the Tarus the Bull has two eyes, red Alderbran and brilliant white Venus. Meteors inspire a lot of things in us, so it is no surprise that they inspire poetry in people. Here is one poem from the Meteor contemporary Poetry Project, which publishes twice yearly. You can find back issues for December 2005 (and links to previous issues) here. 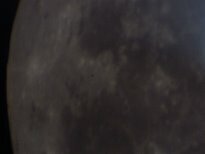 Here's a mosaic of the Moon one day before new, taken on the 26/4/06. Click on it to get the full size view. Lots of turbulence, and close to the dawn, so not the best, but still easy on the eye. I'm going to quote a large chunk of a press relase from the Australian Academy of Science, about a combined statement of national science academies on the importance of teaching evolution. A link to the actual statement is provided down the end. confused with theories not testable by science'. at least 2.5 billion years ago. of action and their limitations'. (click image for larger version). Well, I didn't get up for Australia's historic match against Croatia, where we drew 2-2 and got into the final 16. I did get up to see the landscape covered in fog, and went back to bed. 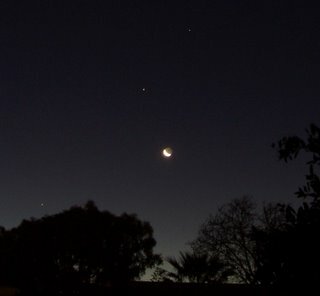 Getting up later, the fog had gone, and the Moon and Venus glowed just above the trees, so I rushed in and got the camera. Just as I set up, the cloud came over, and I snapped this image just as the cloud moved over the pair. Update: You will have to download the animation here (warning 1.8 Mb file) as blogger photos converted it to a non-animated png file. A month ago, I was inspired by an animation of the Moon setting (which I can no longer find on the web), to make my own. I finally got around to sorting it out, and here it is (you have to click on the image to the left to see the animation). There is a big jump in the middle, where the camera decided to take out-of-focus images for no apparent reason, but otherwise it looks okay. If the weather is kind, I will have another go and see if I can get all the images in focus. 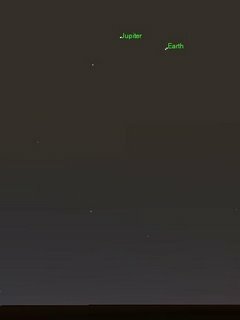 Via the Bad Astronomer, pictures and animation of the Earth and Jupiter rising on Mars, courtesy of the Pancam on the Mars rover Opportunity. The image to the left is dawn on Mars, on 29 December 2005 (when the animations on the Pancam page were taken) rendered in Celestia. Here in Oz (and the Southern Hemisphere), it is the longest night of the year. Over in the Northern Hemisphere it is the longest day of the year. The Bad Astronomer and Stuart have nice mediations and links on this. Of course, although the days are getting longer after this, it will still get colder. This is due to the heat budget of the earth, the planet has cooled off, and it will take a while to re-heat it. Exactly what part of the Earth is responsible is not clear. This site claims the oceans, this one seems to claim the entire planet. Anyone know which is right (or a better soruce for an explanation?). Image from Dave Gee's interactive Occultation Map site (click to enlarge, or better yet, visit the site). 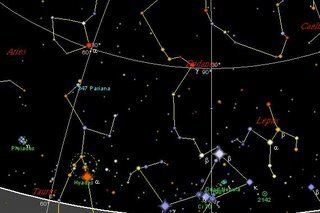 On Monday July 24, minor planet 347 Pariana will occult the unaided eye visible (mag 3.7) star xi Tauri (HIP 16083). While asteroids occult stars reasonably often, an Asteroid occulting a unaided eye visible star is quite rare. The event will take place at around 4:00 am ACST (4:30 AM AEST) (see details here). The event takes place in the morning, but before astronomical twilight, so xi Tauri should be easily visible (and its disappearance also visible). 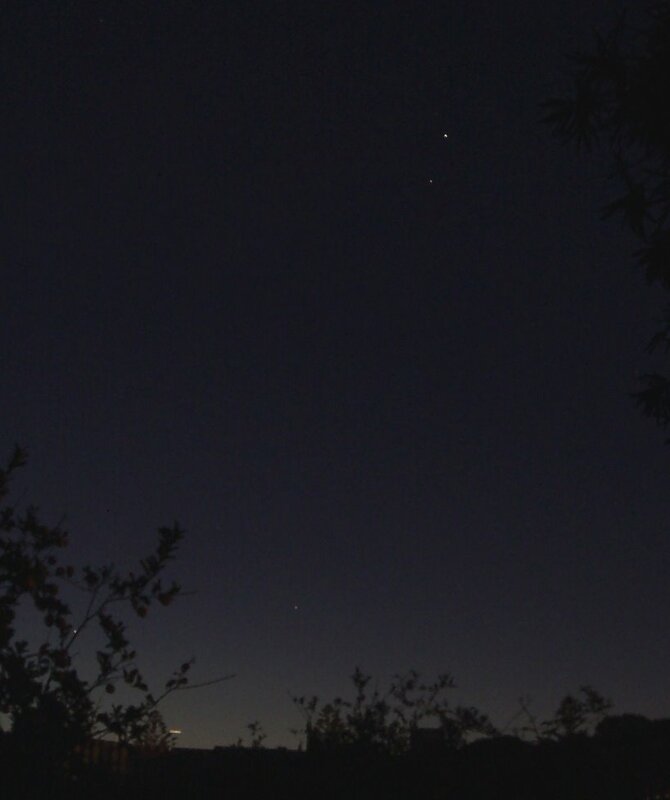 This image (click to enlarge) shows the eastern horizon as seen from Adelaide at 4:00 am ACST on the 24th. Similar views will be seen elsewhere in Australia. 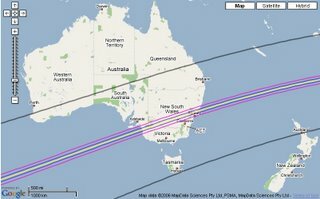 The chord of the asteroid occultation passes through Newcastle, Lithgow and Cowra, so NSW folks will have the best opportunities closes to them. From my point of view, the closest good observation site is Keith, a fair hike away. If the weather is good I may attempt it. 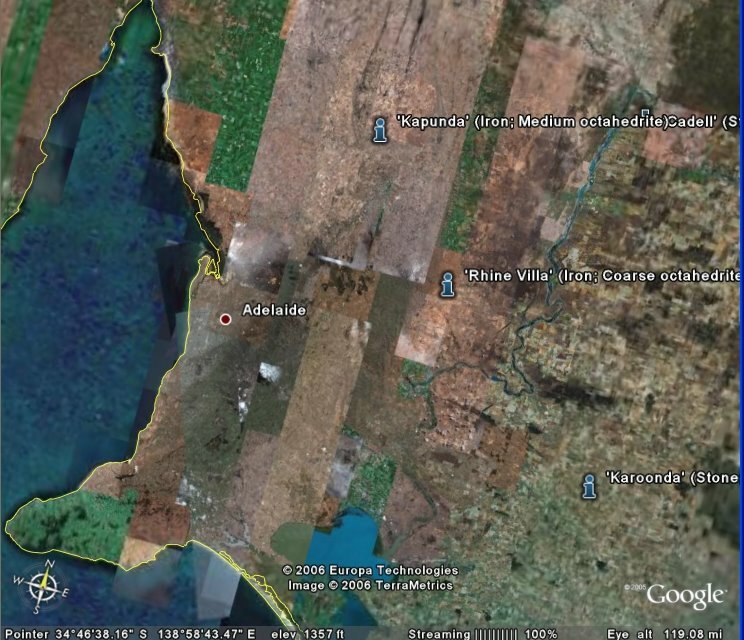 Google Earth and Google Maps keep on turning up useful items for the amateur astronomer. 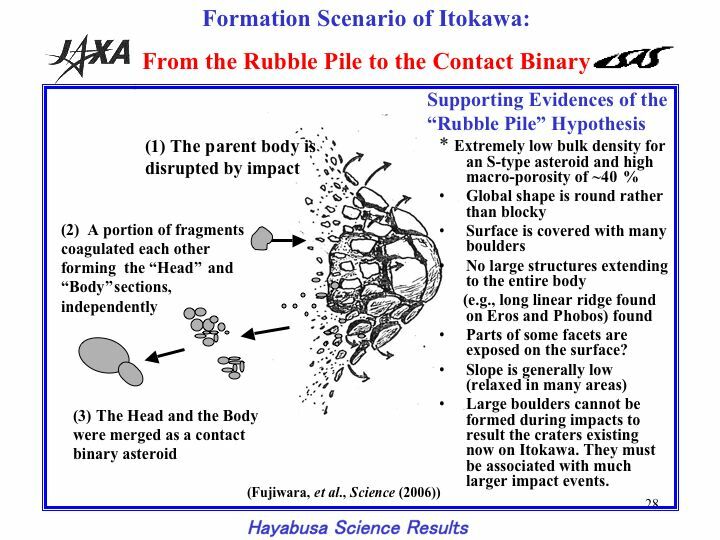 The first image on the left (click to enlarge) is from the impact craters section of geology.com. This image shows the Acraman crater in South Australia, one of the top 10 impact craters world wide. Around 590 million years ago, a bolide impact blaster out this 90 km diameter crater and scattered ejected for 560 km around the impact point. Ejecta from this event got as far as Adelaide, and I have traced the ejecta line in the Flinders ranges. The only organisms around at the time were small squish wormlike things, but the impact would have been devastating to them. 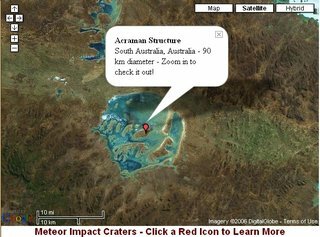 The geology.com site allows you to explore the 50 most obvious impact craters in the world. In contrast, the Meteor Impact database for Google Earth has data from around 26,000 meteor impacts in 127 countries, with a wide range of data on the meteors themselves. 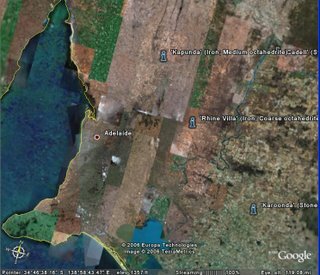 The image to the left shows meteors recovered near Adelaide (click to enlarge), but the database is breathtaking in its coverage. You can download the KML file directly here. Some nice images of the Moon I captured this morning (114 mm Newtonian, unguided, captured using a quickcam and Vega software, 60 frames stacked in Registax). It was good to be out imaging again, even if it was freezing, with crackly frost underfoot. Some very clear definition in the crater walls and laval rilles. Venus is now a pale imitation of its former glory. Compare the righthand image taken this moring, with the lefthand image taken back in February (images to the same scale). 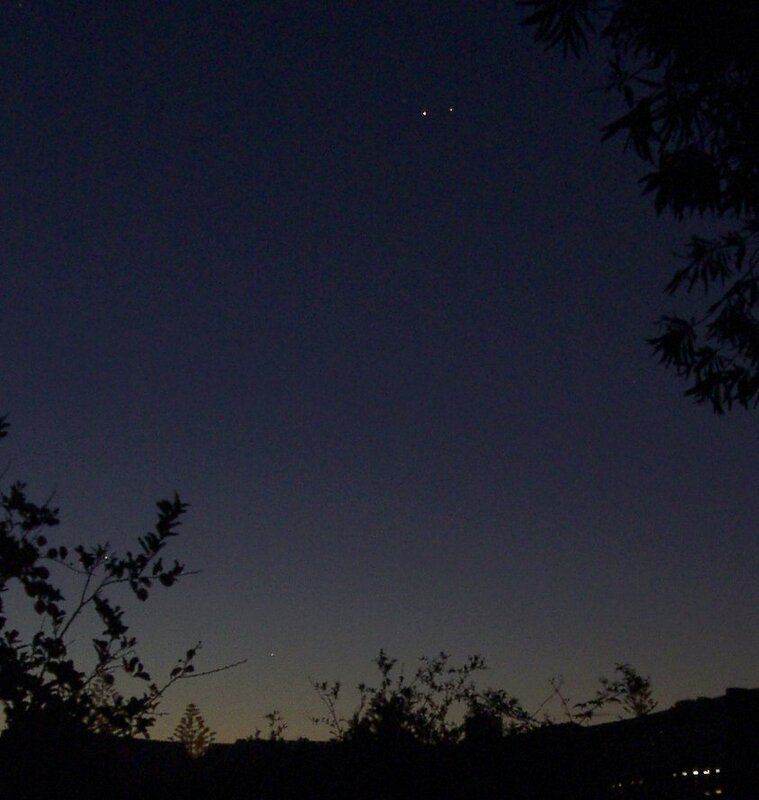 Venus is now low in the morning sky. But it is still worthwhile geting up to see it. 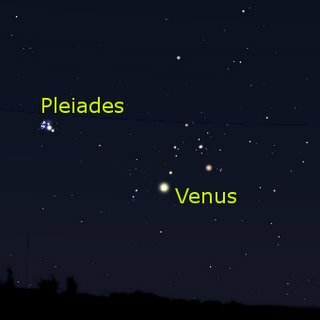 On Friday June 23, the Crescent Moon will be just above the Pleiades, and to the right of Venus. This wil be another opportunity to see Venus in the daytime by using the Moon as a guide (always be sure that the Sun is blocked by a building ot wall before trying this). Memorise the location of Venus relative to the moon before sunrise, and after Sunrise, look to that same spot using the Moon as your anchor point. (click to enlarge image) Well, the Mars-Saturn conjunction is now over, over the coming days Mars and Saturn will draw apart again, but the show isn't over yet. Mercury is now pretty obvious (it's lurking in the left-hand trees in this image, you may need the larger version to see it) and slowly rises towards Saturn. On June 28 and 29 the thin crescent Moon will join the line up for a really great evening display. While I've been gathering the odd conjuction image, I've also been doing some biology blogging over at the Panda's Thumb. Why not pop over and have a look. So no Mars and the Beehive tonight. The sky is crystal clear now, mocking me. So I'll send you over to Grrlscientist for a lovely circumhorizon arc. After the possible Norwegian meteor impact, comes a video on NASA's science site of a meteor impact on the Moon. 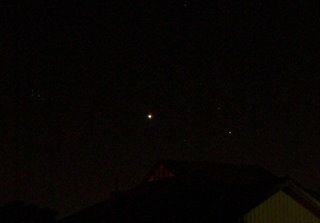 Image of Mars and Saturn (click to enlarge, those with good monitors can see Mars and Saturn close together (just) others, you have to click to see anything. I can't get the images to turn out the same way twice (sigh)) taken on 15-0606 at 6:05 pm ACST. The problem with these evening shots is they occur just at tea time, so I have to hurriedly set up the camera while setting the dinner table, setting up the scope is out of the question. 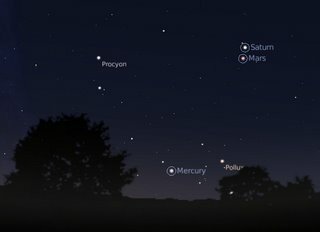 Anyway, when you click this image, not only will you see Mars and Saturn closer than last night, but you will also see Procyon close to the horizon, and there peaking from behind the lefthand bushes is Mercury. Later, around 7:00 pm, by which time it was dark enough to catch the faint stars, I used binoculars to see Mars amongst the twinkling stars of the Beehive. If you are using binoculars, don't forget to let few minutes go past to get your eyes dark adapted, or you won't see the majority of the Beehive.  In the scope it didn't look so great, Mars was a distinct, if featureless red circle, but all the interesting parts of the cluster were just out of the field of view of the eyepiece (but I only had my high power eyepiece out, unfortunately). Friday night (16-06-06) promises to be better if the weather holds out. 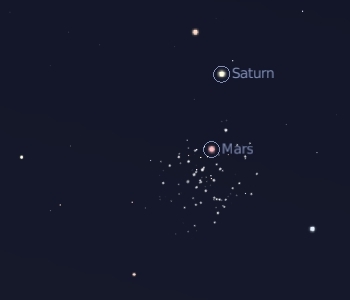 As the Stellarium charts shows, Mars will be close to some of the prettiest parts of the cluster. Friday is Pizza night, so I may have time to set the scope up properly. Although if we have the dew we had tonight, it may not work so well. By the end of my viewing session, the scope was dripping with condensations and the eyepiece was completely fogged up. Not much imaging likely to happen. This is an image of the northwest horizon on 16 June, at 6:00 pm ACST (click to enlarge). 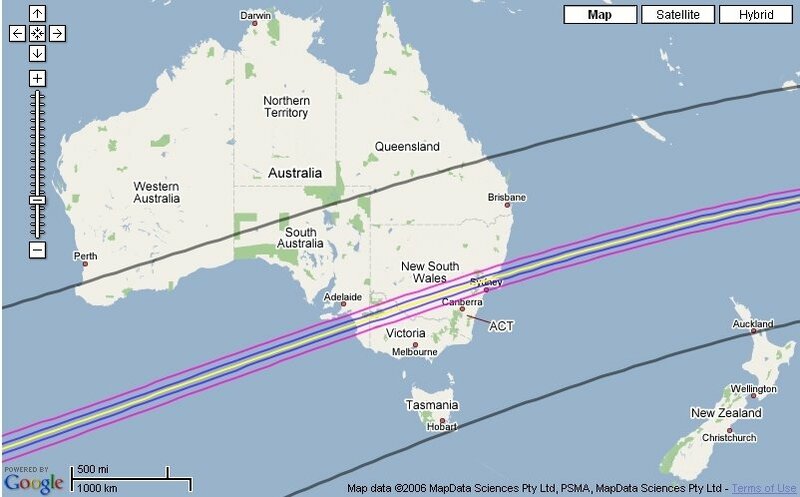 Other sites in the southern Hemisphere should see similar views at equivalent local times. 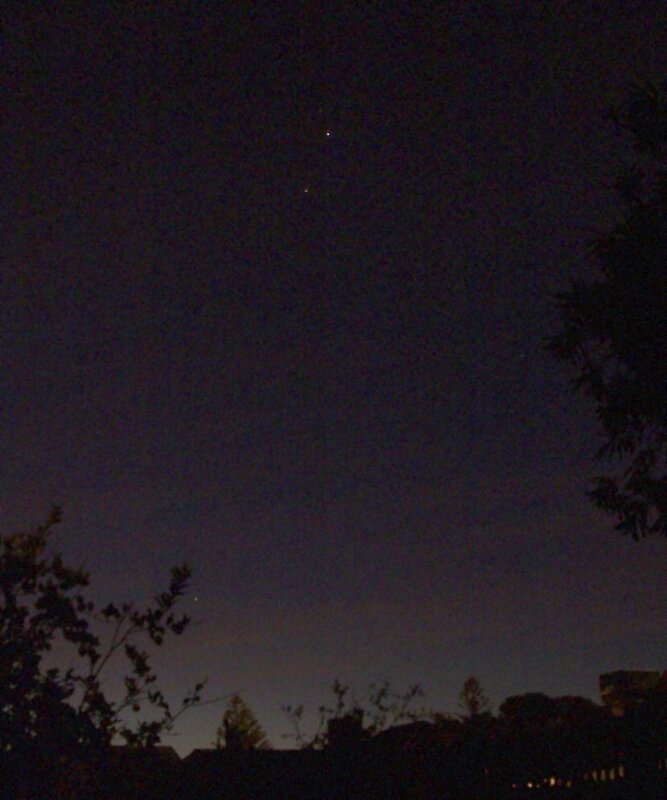 Mars and Saturn get closer (click image to enlarge). I've exagerated the gamma on this image so people with old monitors can see Saturn and Mars without clicking. The Beehive glittered between then like a swarm of firefiles. Tonight and tomorrow night Mars is in the heart of the Beehive so don't miss it. Run, don't walk, to robp's Dirty Skies for this fantastic animation of Enceladus occulting Tethys and this animation of Enceladus occulting Titan. There have been reports coming from Norway of a large meteor which possibly impcated the Earth. Several witnesses saw (and recorded) a bright bollide steaking through the daytime sky. Initial reports of a loud report and sismic disturbances suggetsed that something impacted the Earth. There was a bit of hype with one claim as much energy as the expolsion at Hirshima was released. A later report showed what is claimed to be the impact site (as well as reassuring us the meteor wasn't radioactive :-). But is it? Meteor impacts are notoriously difficult to pin down. There has been a lot of discussion of this on the meterobs list, and opinons range from a true impact site of a 12 kg rocky meteorite to it being just a landslide. The landslide option is, sdaly, looking more likely at the moment, and the impact site may be in a far differnt location as well. 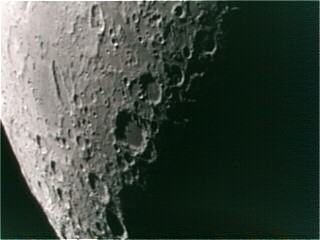 Image, Moon through 50 mm refractor, taken with hand held Olympus mu300 digital camera. Yes, we're back. Tired, smelling of wood smoke, but back. Saw some great skies, I'll tell you about that later. Chez Reynella is off camping over the long weekend, at the little Dessert National Park. A bit thin on internet sites out there, but great bushwalking and if the cloud keeps away, great (if Moon haunted) skies. See you Monday! The Central West Astronomical Society has an astrophotography exhibition and competition, the "David Malin Awards". Follow the link for details and entry forms. Entries close at 5:00 pm on Friday, 16 June 2006, so if you have a fantastic shot, better get it in quick. There are categories for plain old cameras, telescope shots and a special under 16's section to encourage younger astrophotographers. The images will be displayed at the CSIRO Parkes Observatory's Visitors Centre during July, and will also be featured in "Australian Sky and Telescope" and "Sky and Space" magazines. Have a go! Mars is below Saturn in this image (the two barely visible dots off to the right), off to the left is procyon.  and if you click to enlarge the image, you can see the plantets much better, and faintly see delta and gamma Cancerii above and below Saturn. 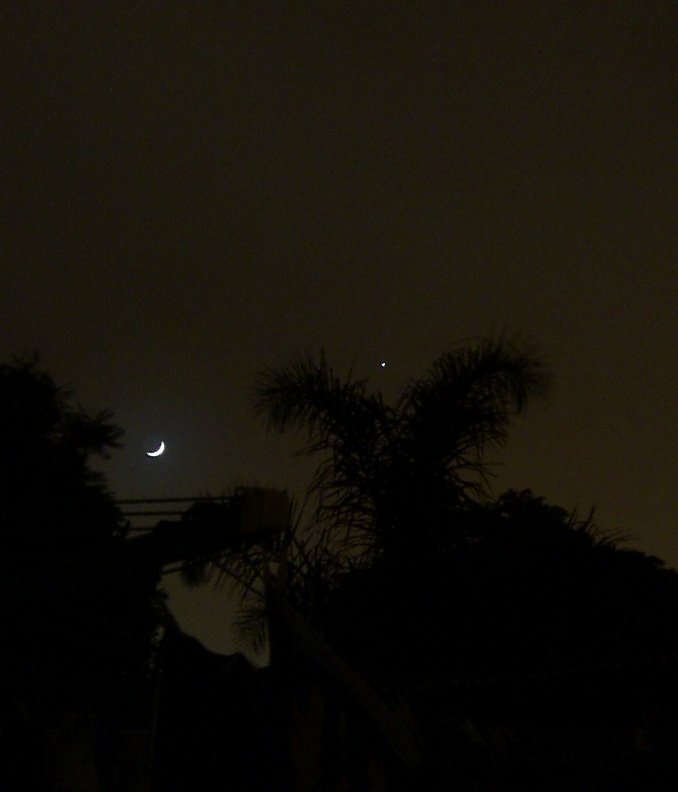 Speaking of conjunctions, there is another nice conjunction coming up. 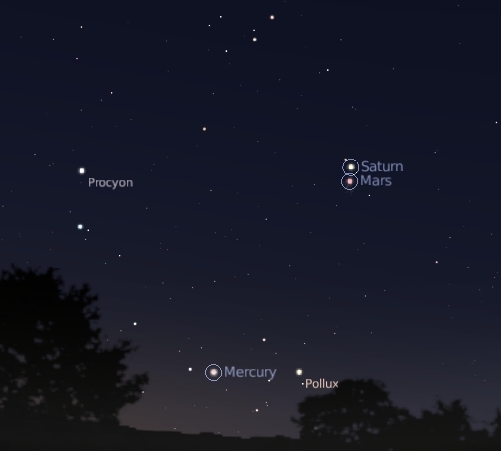 Over the next week Mars and Saturn will come closer together. North-western horizon at 6:30 pm ACST on June 15, other Southern Hemisphere locations will see similar views at similar local times. 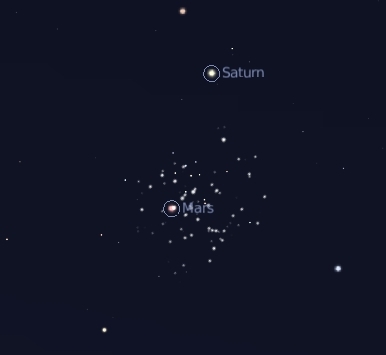 On the 15th and 16th Mars will be in the centre of the Beehive cluster, a fingerwidth from Saturn. You will need a clear, reasonably level horizon, as they will be relatively close to the horizon. 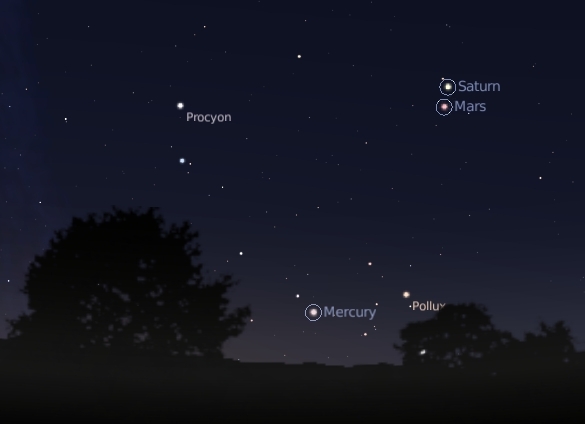 Mercury can also been seen low on the horizon. This will look spectacular in binoculars and small telescopes, although, with the planets being close to the horizon, this may be a problem. On the nest few days, Mars and Saturn draw closer still, until on June 18 Mars and Saturn are less than Half a fingerwidth apart, on the edge of the Beehive cluster. This will also be a pretty astounding sight. 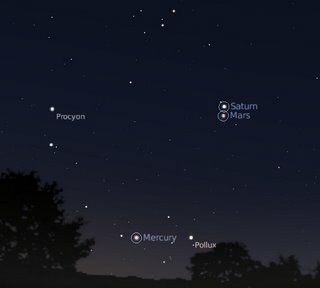 Mars and Saturn set around 8:00 pm, so you have to get in early to view them. 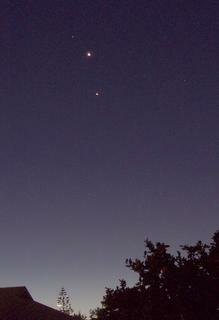 Remember the great conjuction of Venus, Jupiter Spica and the Moon back in September 2005? Well, run, don't walk, to The Conjunction Project, where Kevin Rosero has collected 111 links to images from 96 photographers in 21 countries. It's stunning, and it is all tied together with an illuminating (and interesting) comentary. Go! Read it now! Remember RedSpot Jnr? The massive storm on Jupiter formed by fusion of several other smaller storms that is now about half the size of the Great Red Spot? Well, Red Spot Jr's been progressively getting closer to the GRS itself. They are now about a GRS width apart, and will get closer. Their closest approach will be around July 4. You can watch the process in a series of images from the stunning RedSpot Jr web site. Red Spot Jr can be seen in many amateur telescopes, it has been picked up in 8" reflectors, and it might be possible in 6" with good condition. My little scope is right out. So why not have a look tonight? There is a transit at 11:42 (ACST) and another at 7:30 ACST tomorrow night. If you pop over to Stuart's blog you will find the latest edition of Jodcast, the Jodrell bamk Podcast. You will also find an article about astronomy toilet paper. It's from Japan. Say no more. This is a great image recently featured on Astronomy Post of the Day. A coposite image of radio, visible and X-radiation, the inset shows a wake of high-energy particles left as the neutron star speeds through space. 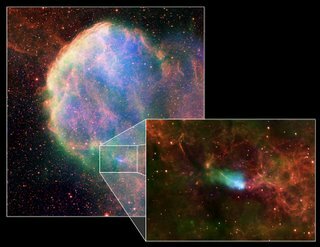 Why the neutron star has been kicked out at high velocity is a mystery though. Update: Tom has a better article on this object. Pop over and read it. Now that's a Black Hole! 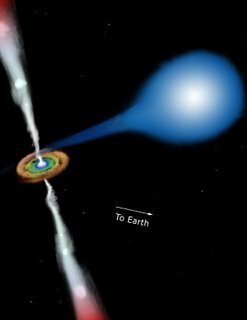 Via Voyage to Arcturus, comes news of an award-winning site on Black Holes. It is a fantastic resource for all those who want to know about black holes. With great animations and step through demonstrations, it is great for the younger learners. My kids and I worked through sections of it this morning, and had great fun dropping a clock into a black hole. However, having emphasised that things that fall into a black hole can't come out, when we watched Galaxy Quest tonight, MidddleOne turned to me with an accusing look when the ship passed through a black hole. 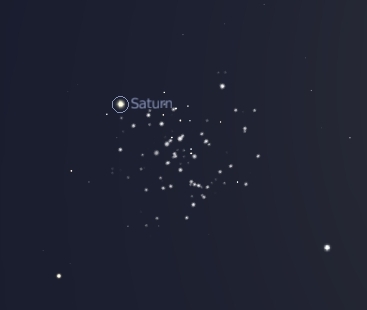 Just a reminder that June 3-6, Saturn will actually be in the outskirts of the Beehive, 30 deg (half a fingerwidth) from the core of the lcluster, and a mere 12 deg from the nearest bright star of the lcuster. Delightful viewing in binoculars. Rememeber Hayabusa? 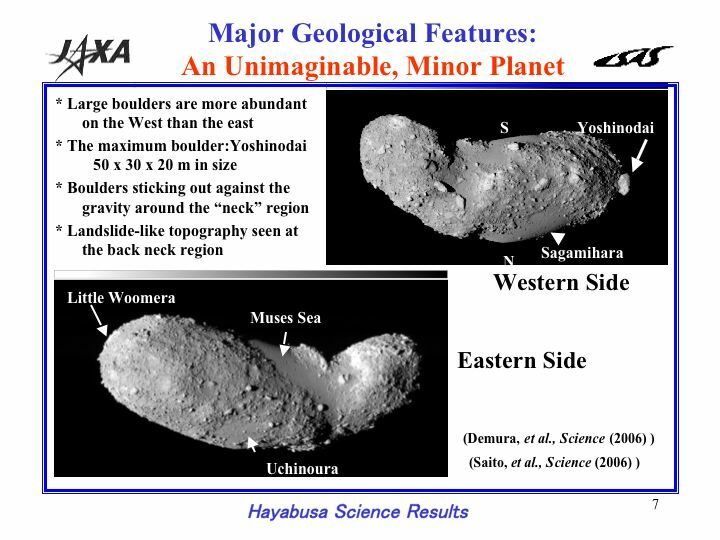 The plucky little probe that landed on the asteroid Itokawa? Well, after a few mishaps, like losing the asteroid hopping robot, crashing into the asteroid and a potentially diasterous fuel leak, mission control has recovered control of the probe and is nursing it back to Earth, hoping to arrive in 2010, landing in the Australian dessert. The scientific results (to date) of this amazing mission have were published in special issue of Science Magazine today. 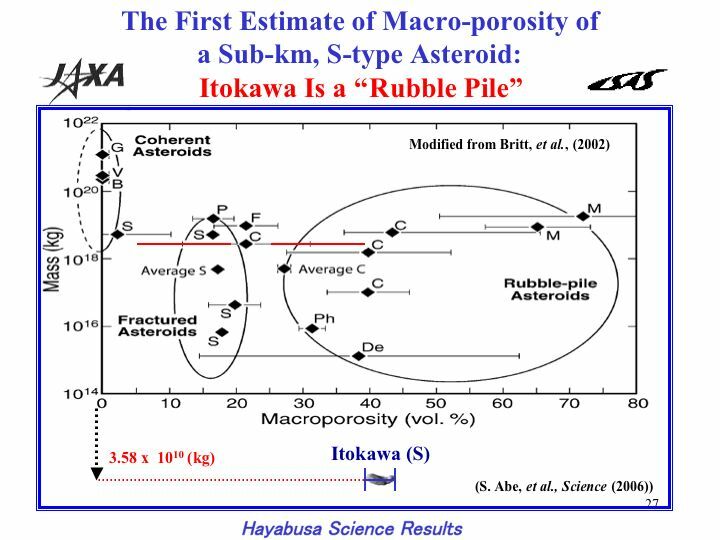 One of they key findings is that Itokawa is a rubble pile, and astoundingly porous structure with a porosity of about 40% (sand has a porosity of around 20%!). How it managed to form, and how it manages to survive continued impacts, is a bit of a mystery. 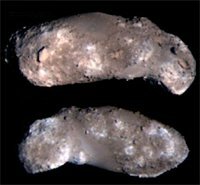 Also, if Itokawa is represenative of smaller asteroids, deflecting Earth bound asteroids may be a lot harder than we thought, if they are a loosley bound mess of sand and boulders. Image Credit Ohio University. Map of East Antarctica showing crater, circled, in comparison to the Chicxulub crater. While the debris of 73P didn't put on a sky show, the creatures of the Permian may have had a far too spectacular show. Researchers have used radar and gravitational anomaly mapping to locate what appears to be a 300 km wide crater buried a mile under the Antarctic ice. Bigger than the Chicxulub crater associated with the Cretaceous/Tertiary extinction event, this crater appears to coincide with the massive Permian extinction event. Of course, the crater has to be confirmed as an asteroid impact, a bit difficult when under all that ice, but the investigators will look for characteristic rocks scoured out by ice streams. 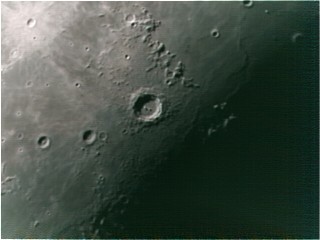 Some great images of the area, and comparisons with other craters, can be found here. ...when your colleague confirms that the anti-Alzhiemer's drug you are helping develop has a second, potent, anti-Alzheimer's property. Kallo Kallay. Much leaping and jumping about. Now we just have to get someone to fund our research. Time to get cracking on grant writing (when I finish assignment and exam marking). With my luck the wonder compound will turn out to be insanely toxic. Also, the big frog neuropeptide review came out today. I'm a (very) minor co-author on this monumental work, but I do share the stage with Mike Tyler, and they have a picture of me on the review as well. Hopefully this won't put people off reading it. Now I have to convince the Learned Professor we need to examine nitregic nerves. Astronomy connection? When I gave the second years their exam information talk, I mentioned the planetary lineup that will occur on the night of their exam as something to look at to reduce their stress. Well, despite last nights high radio meteor rates, no one saw anything outsatnding (but then again, it looks like most folks had poor weather). Here it is 9:15 pm ACST and the radio meteor activity is high again, that site is a little hard to interpret this site gives a more user friendly look at the rates. Looks above 200 meteors/hour at most sites. Of course, the radio detects entries we can't see by eye, so the visual rate will be less, much less probably. Anyway, there is a break in the cloud and delta Bootis is visible, I'm going out. During my brief observation (radiant was only 12 deg above the horizon, limiting magnitude around 5.5) I saw nothing. I have seen no reports of high t-taurid activity anywhere. So was the radio alert a false alarm? Having multiple radio stations picking up high meteor rates for two nights in a row suggests not (and the bloke who runs the network doesn't think so either) but radio reflections can pick up smaller particles that we can't see, so it might have been a "microfine" shower. Saturn on the border of the Beehive cluster. 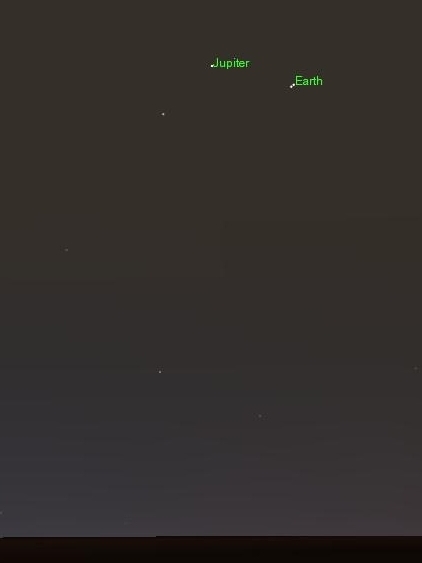 Stellarium simulation of binocular view. For the next few days Saturn will be right on the border of the Beehive cluster, this will be awesome in binoculars or a small telescope. With a low power objective that shows the rings and the cluster, the sight will be amazing. 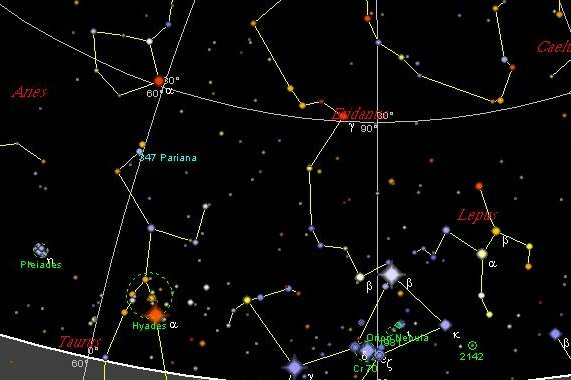 See Southern Skywatch for location maps and descriptions. The June Southern Skywatch is up. The dance of the planets, the occultation of Uranus, new 73P spotters maps and more is detailed.